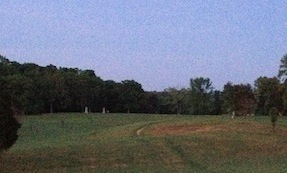 Darkness sat still over Spotsylvania this morning when I first arrived, and the firmament twinkled with a thousand stars. It was much clearer today than it was 150 years ago as Federal soldiers marched into position for their attack on the Confederate salient. I was here to follow in their footsteps in real time. Federals had been under orders to maintain silence, but when they captured the picket line along Landrum Lane—which had been fortified—they let out a loud “Huzzah” because they mistakenly believed they’d captured the main Confederate line. Instead, they gave away their element of surprise. 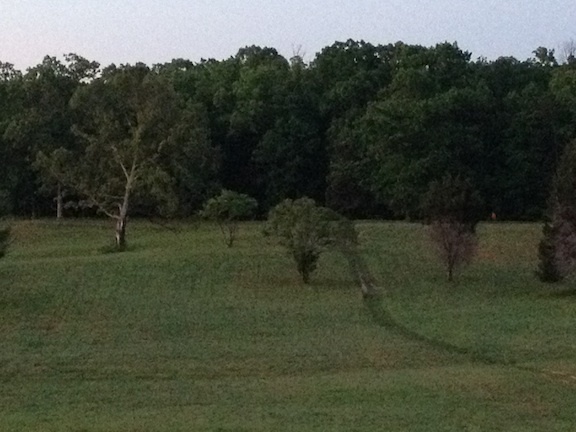 After reforming, they resumed their advance, sweeping forward into the swale between the lane and the Mule Shoe (pictured below, from Landrum Lane). Their timing could not have been more advantageous. 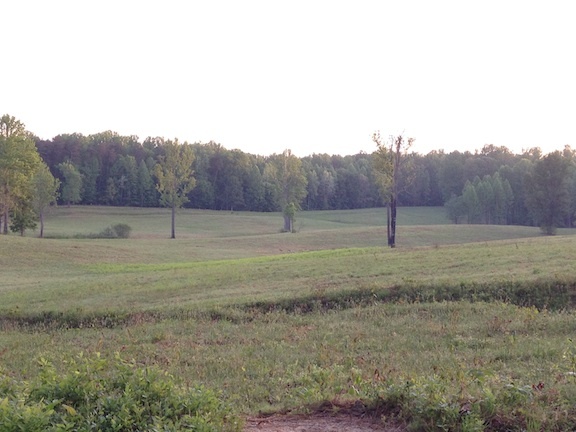 Confederates, hearing the huzzah, soon responded by opening fire—but they aimed at the ridge where the lane ran because that’s where all the noise had come from. By that point, however, Federals were down in the swale, protected by the landscape, so the Confederate fire went over their heads. Federals swept up out of the swale and slammed into the Confederate works, hitting the salient squarely on the nose. 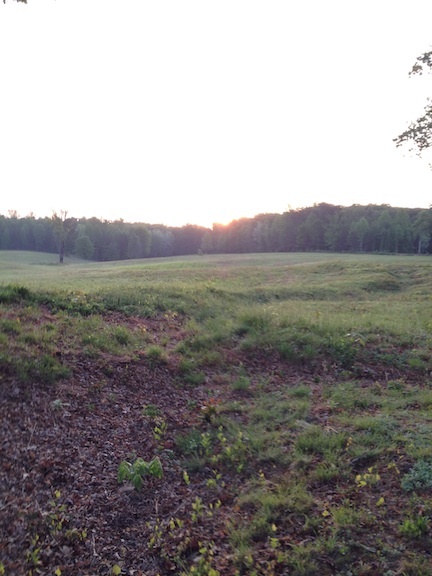 This morning, as the crowd crossed the bridge into the interior of the Mule Shoe, the sun finally topped the treeline (below), but in 1864, the skies were slate gray. Rain had fallen all night, although it had thinned to a fine mist by the time of the attack. The sun would almost push through the gray veil—but not quite. Kris White’s ongoing series today will chronicle that battle and its unique horrors: the battle of the Bloody Angle. 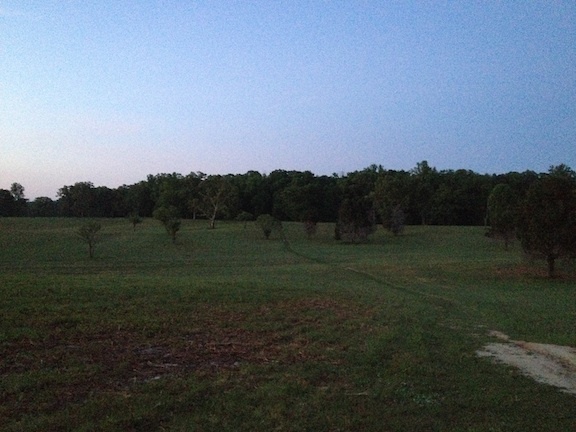 This entry was posted in Battlefields & Historic Places, Battles and tagged 150th Spotsylvania, Battle of Spotsylvania Court House, Bloody Angle, David Birney, Francis Barlow, Landrum Lane, Mule Shoe Salient, National Park Service. Bookmark the permalink.